Making a fruit scratter is a little more tricky if you don't have your own lathe, but it is still not hard. 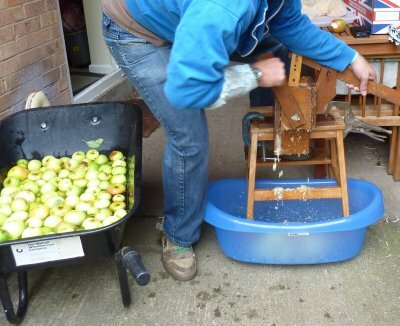 A cider press is useless without a scratter to smash up the fruit so you will need one. 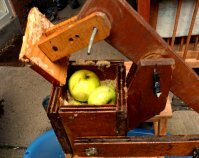 You can buy fruit pulpers and apple scratters, but why bother? The concept is very simple, a rotating cam with teeth on it (screws) that rip up the fruit and push it out of the bottom to be caught by a bucket. This is very simple and quick to make yourself. Of course, you'll need something to clamp your scratter to and a stool works brilliantly, if you don't have one then IKEA can provide one for a little over £10. Of course if you don't fancy making a scratter, you could always employ the 'scratter' you were born with - your feet. Stomping the apples with your feet was the way we did things when my dad was young (and some traditional cider makers near us still do this). What sort of scratter is best? Electric or Hand Operated? The plans below are for a traditional hand scratter and if you click here you can see plans for the cider press. The scratter in the photo was my grandfather's and is close to 100 years old, so the design is well tested. You could easily convert this to an electric scratter (use a hand drill to drive the cam as described below), but unless you're thinking about producing more than 20 gallons of cider or perry you really don't need one. An old farmer and perry maker once told me that folks who couldn't face turning a scratter handle for 30 mins and needed a machine to do it for them, did not have the right attitude to ever make a decent cider - although I laughed at him back then, these were very wise words. A good cider or perry is all about simplicity and patience. An excellent cider or perry is all about experience in simplicity and patience. You will not make a truly excellent cider or perry on your first try, but you can make a really good one - you can click here for my recipes for cider and click here for perry recipes Both are made using a traditional hand scratter and it is as much about the granularity of the mash that you get from using a hand driven version as it is about the apples. My recommendation is use a hand scratter unless you're producing loads of cider or perry. Basically, you clamp the scratter on the stool. Place the bucket beneath the scratter, whack in some fruit, then press down on the lid and turn the handle. The mashed fruit will fall out of the bottom of your scratter and into your bucket or container. Job done. There's not a lot to this, other than have a look at the pictures below and make sure you build a side on the scratter that can be clamped. 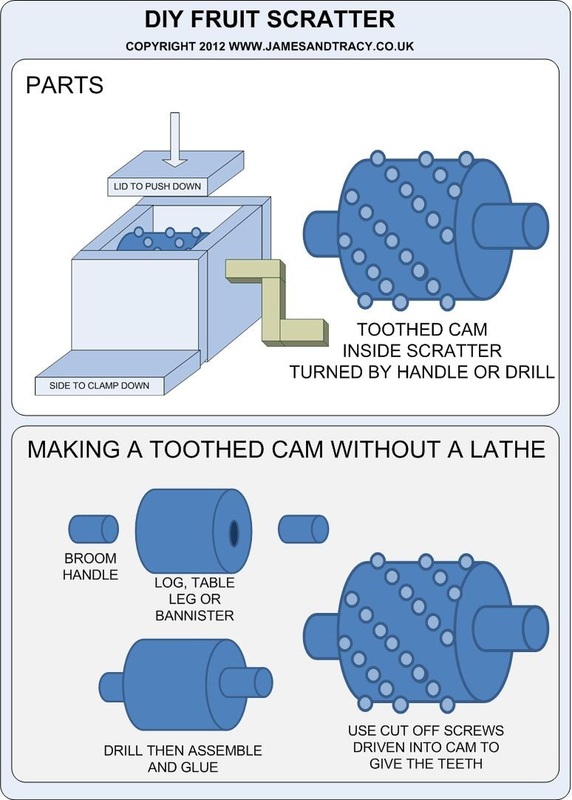 The concept (and it works well) is that you hand turn the toothed cam in the scratter with a handle screwed onto it. However, if you don't fancy the work, then use a bolt set in the cam to allow you to drive it directly by a hand drill. The key bit to an effective scratter is the toothed cam. Mine is lathed from a log, but you don't have to go this way if you don't have a lathe. I have seen perfectly good scratters made from a round table leg that has been cut down and had 2 x dowels inserted. If you can't find an old table leg, bannister etc. than you can buy a round fence post or just use a log. If you are using a log strip the bark! After that cut it down to size to form the internal cam cylinder and then drill 2 x holes with a tank cutter or similar to insert the dowels (bits from a broom handle works well). The simply screw in some screws all around the cam to provide the "teeth" and (if you really want to) cut their heads off with some pliers to give "sharp" teeth to the cam. That's it.